I had four days to come up with a great costume for a party I was going to and I didn’t want to spend a ton of money. My first stop was the local Halloween stores and it was the same old, same old stuff, I wanted something different. I knew I wanted to build some kind of illusion costume so I figured I’d need a big fake body, fake head, fake arms and some kind of structure to support it all. I found an old Rob Zombie mask I had from years before and started with that. 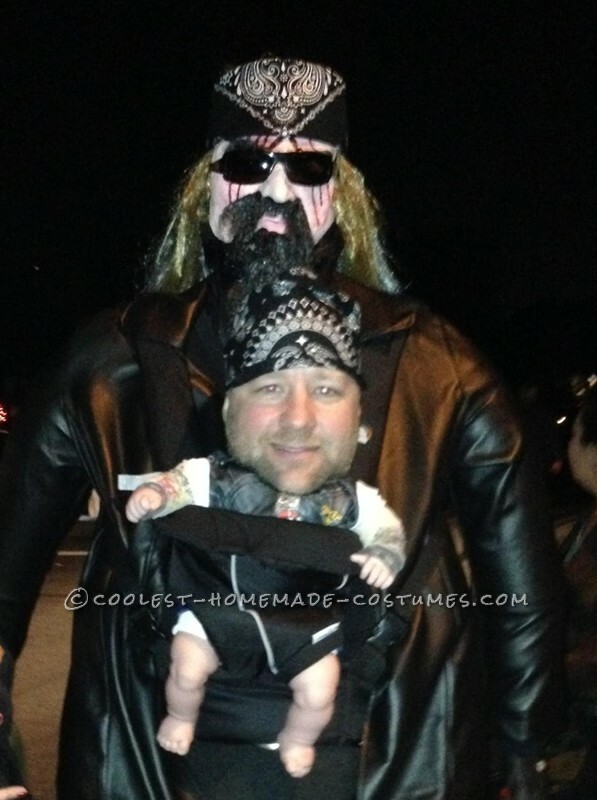 I thought it would be really funny to be a biker baby being carried around by a giant biker. I started building the structure. I went to home depot and got some long thin pieces of wood, some duct tape (gotta have duct take to build costumes) some moving bubble wrap and a Styrofoam ball that was about the size of a head. Next hit up Walmart and got a super cheap front baby carrier and a life sized baby. I built the structure with the thin pieces of wood, some old belts to hold it on to me and bubble wrap. I added an old shirt and a long leather coat from the Goodwill store. I added the Styrofoam ball to the top and shaped it to hold the make on it right. I then affixed the front baby carrier to the front of the costume. I removed the baby dolls head and put it in the carrier. Lastly I cut a hole through the shirt in the chest area to stick my head through and position it on the headless baby’s body. A bandana, some shades and voila! I’m a big biker baby. I had my girl friend dress up as the biker momma to complete the costume. I hope you enjoy it as much as I enjoyed building it! Happy Halloween!